Not the sort of thing you would normally buy just for fun. This specific TDR will set you back over $2k so you won’t find one in the average DIYer’s toolkit. In fact, you won’t find one in the average commercial installer’s tool kit. 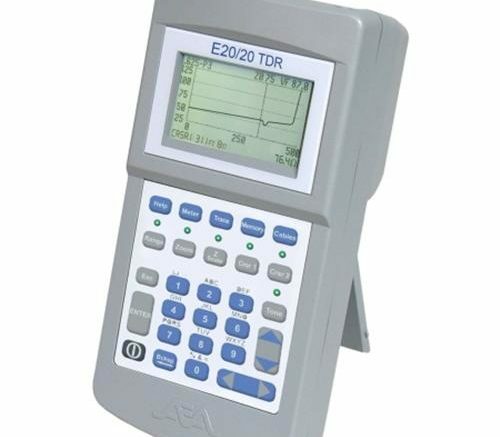 A time domain reflectometer sounds like something that you would use to go back to 1955 and stop Marty McFly from dating his mom, but it isn’t (unfortunately.) It’s a device that measures important things about cables that are located inside a wall, without having to dig them out. See, you might want to know if there’s a bad connection, or an old splitter, or something like that, or you may just suspect that there is 50 feet of old cable coiled up in there. Seriously, this happens all the time in old commercial installs. That’s where a TDR comes into play. It actually measures the amount of time it takes for a signal to get from point A to point B, and if you know how much cable there should be, and what kind of cable it is, then the TDR will tell you with some confidence what’s going on inside the walls. It can suggest to you that there may be a broken connection or a splitter you weren’t expecting, and even tell you how far down the run it might be. It sounds like magic, but it’s simple physics. Just like everything else, it comes down to time. Because signals travel through copper cables in a reliable time frame, it’s possible to diagnose problems by comparing the amount of time it takes for a signal to travel down that cable. You can learn a lot just by counting those microseconds. You can even tell if you have the wrong kind of cable. A lot of old industrial installs still used RG-59 cable, which isn’t rated for the frequencies used for today’s cable and satellite installations. It also has far more signal loss than RG-6 cable and that can be a problem especially if there’s more cable in the wall than you thought. Back in the early days of cable TV, installers just didn’t imagine hundreds or thousands of channels, plus data going back and forth. They did what made sense to them, which was use cable that wasn’t too expensive for the job and splitters that were designed for their needs. Today’s systems require a lot more, but when an installer goes to upgrade an old building, owners don’t want to pay a lot. They always want to reuse old cables and never want holes cut in walls. A TDR can help determine if old cables are any good and if there are old splitters or taps that need to come out before the install can proceed. It’s an expensive tool, but if you need it, it’s worth it.